An artist's impression of the possible planets around GM Aurigae. New observations of a young star and its surroundings are like a snapshot of our own solar system when it was forming, astronomers announced Friday. The star, just a million years old, is surrounded by a disk of dust, the sort of "protoplanetary" disk from which planets formed around our Sun, according to theory. In the disk is a gap that astronomers say likely was formed by one or more giant gas planets, something similar to Jupiter and the other planets we're familiar with. The planets have not been imaged. Rather, the dust and the gap have been seen. 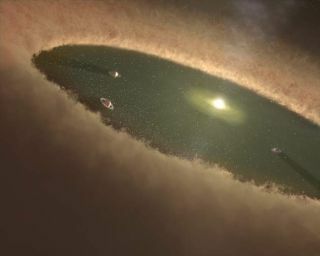 The thinking is that when giant planets develop, they gather the dust from their orbital path, sweeping clean a region of space around the star. Similar setups have been seen around other stars, but few have been so young. This is the first evidence for a planet around a star so young that is also Sun-like. The star, GM Aurigae, is about 420 light-years away. It is 1.05 times as massive as the Sun. If the system were overlaid onto our own solar system, the newly discovered gap would extend roughly from the orbit of Jupiter to the orbit of Uranus. "GM Aurigae is essentially a much younger version of our Sun, and the gap in its disk is about the same size as the space occupied by our own giant planets," said Dan Watson, professor of physics and astronomy at the University of Rochester. "Looking at it is like looking at baby pictures of our Sun and outer solar system." The observations were made with NASA's Spitzer Space Telescope. The finding, along with a similar one last year, has astronomers puzzled that large planets could form so quickly. Conventional theory holds that all planets form first as a rocky core. Earth and the other three terrestrial planets stopped there. But the gas giants then use an ever-building core to begin to attract an vast envelope of gas and dust. An alternative theory goes like this: Rocky planets form in the conventional way, but gas giants don't. Instead, they collapse, over a few thousand years, out of a knot in the ring of gas and dust. "The results pose a challenge to existing theories of giant-planet formation, especially those in which planets build up gradually over millions of years," said Nuria Calvet, professor of astronomy at the University of Michigan and lead author of a paper on the results in the Sept. 10 issue of Astrophysical Journal Letters. "Studies like this one will ultimately help us better understand how our outer planets, as well as others in the universe, form."